If you're looking to build an inexpensive shelter for your vehicle, a carport can be a great alternative to a costlier, more ambitious garage. But erecting a carport involves more than just slapping a kit together. Read on for just a few issues you should consider before you decide to put a carport on your property. Need a place to park that fancy new speedboat? A carport may be just the ticket! While it’s not quite a garage, a carport does a decent job of protecting cars, recreational vehicles, or anything else you might want to shield from the weather. Some homeowners even use them as covered patios. If you’re thinking about building a carport, you’ve probably already looked at dozens of different building options and styles from specialty manufacturers. Still, there are plenty of considerations you need to weigh before you buy a DIY carport kit or hire a contractor. Here, we’ve put together a few of the basics to help you with the planning process. In today’s regulated world, if you want to build anything larger than a doghouse, you will probably have to pull a permit—and a carport is no exception. Note that a carport can be enclosed on only two sides. If you enclose a third side, the structure becomes a garage, which makes it subject to different building codes. Your local building authority will want to see the design plans of the carport you choose, and ordinances will determine where you can put it. Typically, you cannot construct a carport in any easement on the property or within a few feet of the property lines. 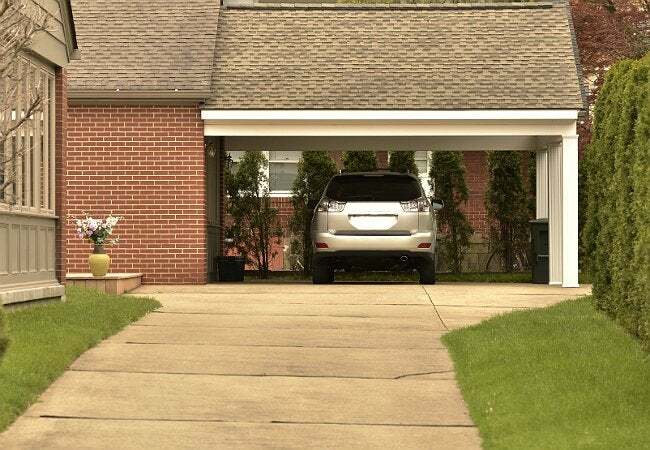 Many communities have covenants that do not allow carports in front yards at all. If you live in a neighborhood governed by a homeowners association (HOA), you will need to clear your carport plans with them as well. HOA regulations may specify particular building materials, limit where you can put a carport, or regulate its size—or, the HOA may just turn you down cold. Legally, you have to abide by their rules. 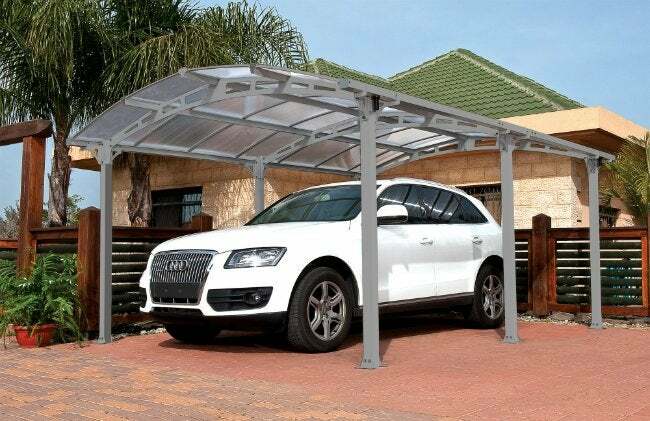 Carports are typically constructed of either metal or wood, and kits using either material can be readily purchased from do-it-yourself stores. Kits vary in quality and price; some run a few hundred dollars, while others top out at more than $10,000. Professional installation will increase the cost of your project considerably, but if you are unsure about your ability to assemble a complicated carport kit, it pays to hire a professional. You can also go for a custom-designed, stick-framed carport—an attractive option, particularly if you want your carport to match your house. Some homeowners choose to set a gravel base or concrete pad under the carport, which adds to the total cost of the project. If you’re familiar with construction, you know the importance of calling your local utility companies to come out and mark the location of their buried lines before you start digging holes for carport posts. The last thing you want is to hit a utility line and get stuck with an enormous repair bill. Fortunately, it’s now easier than ever to locate all the utilities on your property; just call DigSafe at 811. They will notify your local utility companies, which will then check the location of their lines and mark them so you know where it’s safe to dig. Carports do not require foundations, but they must be stable enough to keep from blowing over at the first breath of a breeze. The sturdiest method is to secure the support posts a minimum of 2 feet deep, in poured concrete. If you live in a windy area, or if you’re building a tall carport to house an RV, sink the posts 3 feet or deeper. An alternative method is to attach brackets to a concrete base to hold the support posts. This approach offers less lateral support, so additional lateral bracing and corner bracing will probably be required. Some lower-end carport kits rely on screw auger anchors to stabilize the structure, but this works well only if the carport is protected from wind. A third structural option, if local building code allows, is to attach one side or the back of the carport to the house or to an existing garage. This arrangement increases stability but comes with additional building code regulations. Before you select a final carport design, make sure it will meet your size and aesthetic requirements. The minimum functional size for a one-vehicle carport is 9 feet by 16 feet, but if you need to park anything larger than a midsize sedan, you will need more room. As for aesthetics, you’ll probably want the design and finish of your carport to complement your house. To keep it in sync with its surroundings, you can paint a wood carport to match your home and echo architectural details from your house, such as columns or shingles, to make it appear as if the carport was part of your home’s original design. This way, you’ll not only gain additional outdoor shelter for your vehicles (and outdoor gatherings), but some serious curb appeal, too!